After last weeks announcement of its hot Civic Type R, Honda has now taken the wraps off its American built third generation Civic Coupe, its British built Civic 3-door basic models and its Japanese built Stream 7-seater. The Civic Coupe will arrive in April and will be powered by a 125bhp 1.7 litre VTEC engine with a manual or automatic transmission. 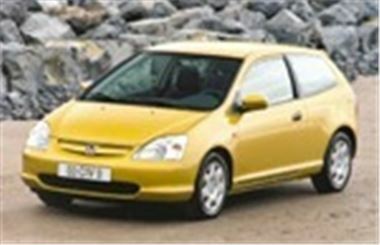 The pretty Civic 3-door will go on sale in September and will be built solely at Swindon for export to all World markets including Japan. Its power plants will be the 90bhp 1.4 and 110bhp 1.6 engines already launched in the 5-door Civic. Like the new Vauxhall Zafira Turbo, the Honda Stream offers a heady mix of seven-seater versatility with power and handling that make it a pleasure to drive. Its 156bhp 2.0 litre VTEC engine will take it from 0-60 in 9.2 seconds and on to 130mph. Transmissions will be a five -speed manual or a new five-speed automatic. The Honda Stream will go on sale in the UK in June, with a 125bhp 1.7 VTEC engine option to be available later in the year. It is worth noting that Hondas previous 6/7 seater, the Shuttle (known as the Odyssy in the USA), was the worlds most reliable MPV by a considerable margin. You will find a picture of the Stream in my car by car breakdown.